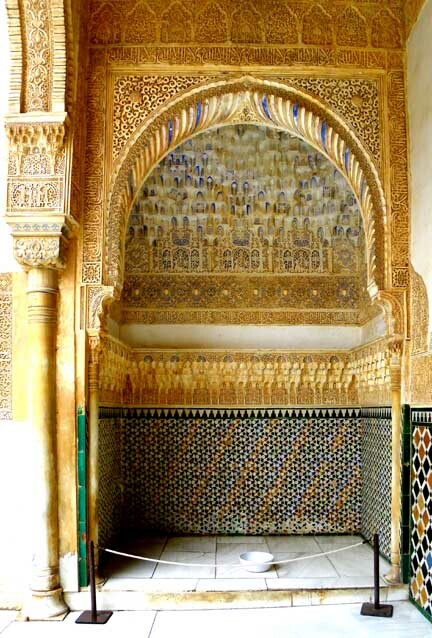 The arches are decorated with stalactites (mocarabes). 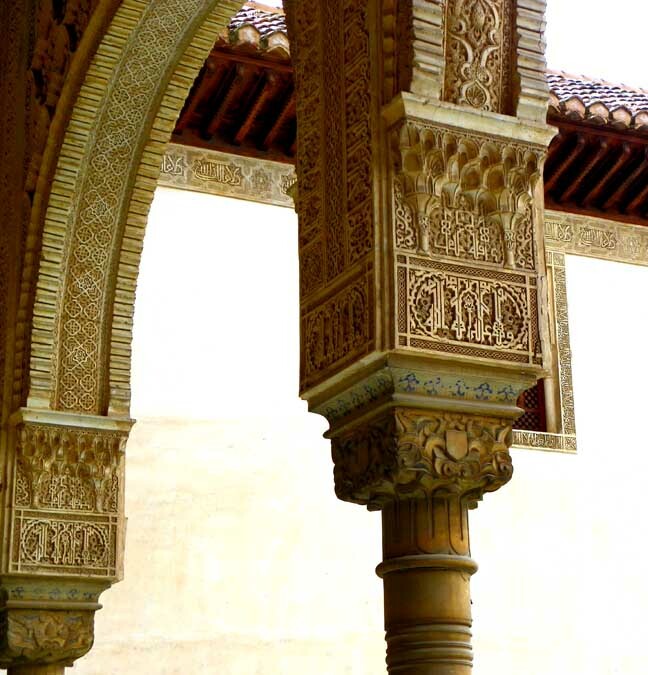 Columns have slim marble shafts topped by a series of moldings which form a collar beneath the capital which consists of two parts: the lower rounded (with "U" decoration) and the upper rectangular. Note fountain in lower left. 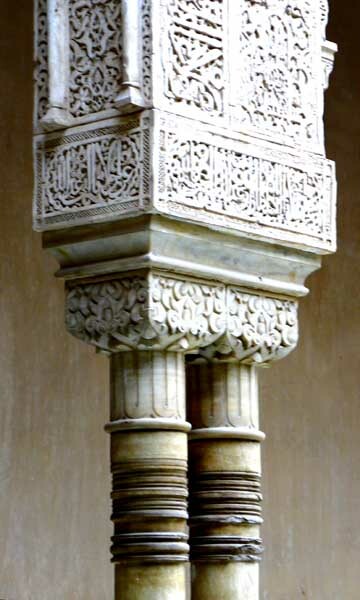 Columns which have slim marble shafts topped by a series of moldings which form a collar beneath the capital which consists of two parts: the lower rounded (with "U" decoration) and the upper rectangular. 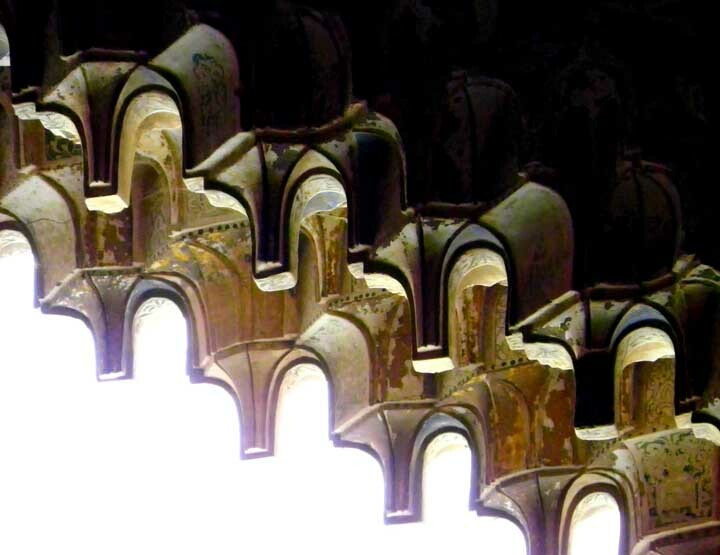 The arch is decorated with stalactites (mocarabes). 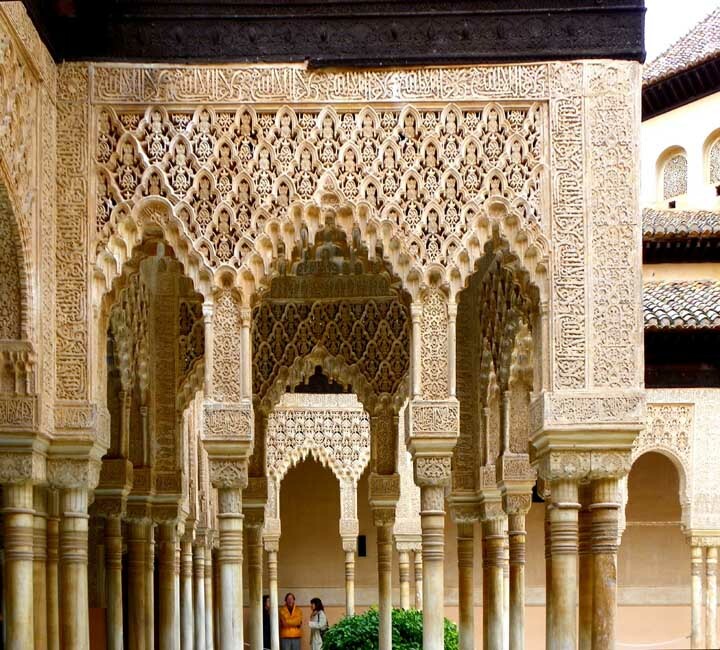 Single and double columns support horseshoe shaped arches. "All surfaces above the columns are covered by colored stucco moldings that seem aimed at denying the solidity of the stone structure that supports them. 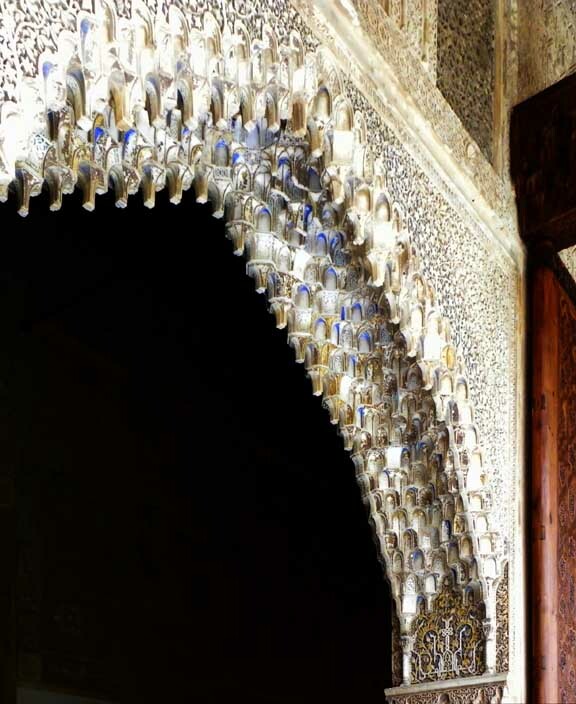 The resulting buoyant, airy, almost floating appearance of the building is enhanced by the "stalactite" (muqarnes) decorations that break up the structural appearance of the arches,transforming them into near-organic forms." - Gardner's Art Through the Ages, Tenth Edition, by Richard G. Tansey and Fred S. Kleiner. Harcourt Brace College. Pub. 1996, p. 332. 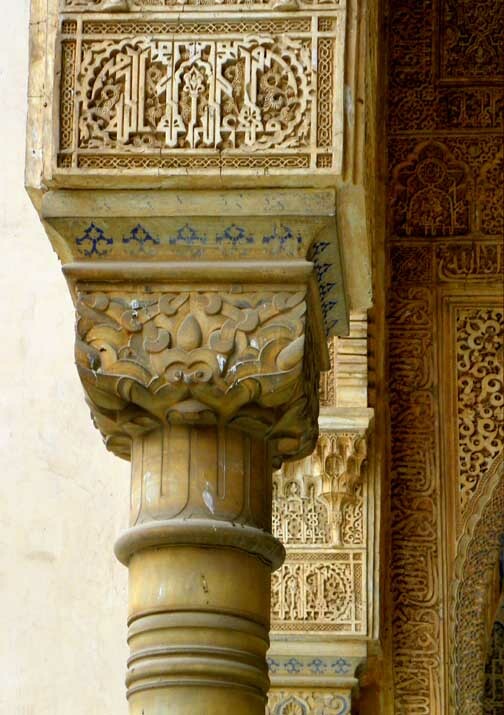 Columns have slim marble shafts topped by a series of moldings which form a collar beneath the capital which consists of two parts: the lower rounded (with "U" carvings) and the upper rectangular (at right, with cartouche decoration). 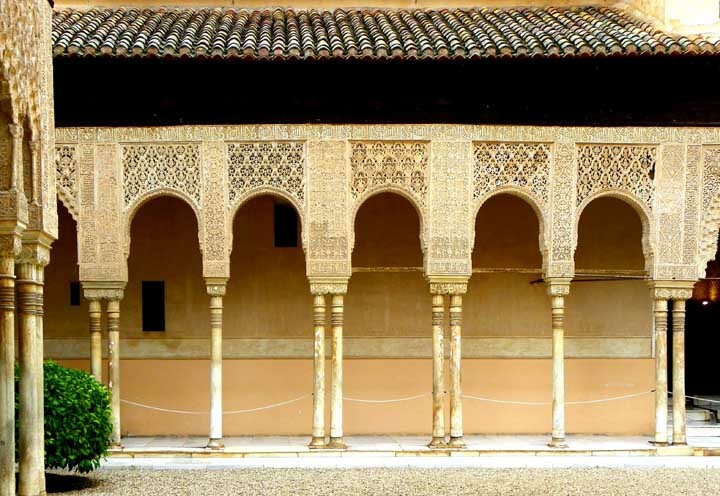 The Courtyard of the Myrtles takes its name from the myrtle bushes that border the central pool. They are evergreen and give off a very pleasant smell when their leaves are rubbed in the hand. 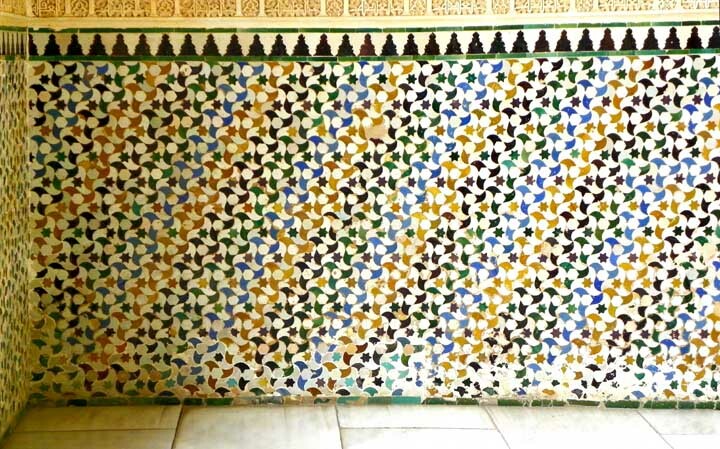 Until the 16th century it was known as "The Comares Court" and more recently as "The Court of the Pool." 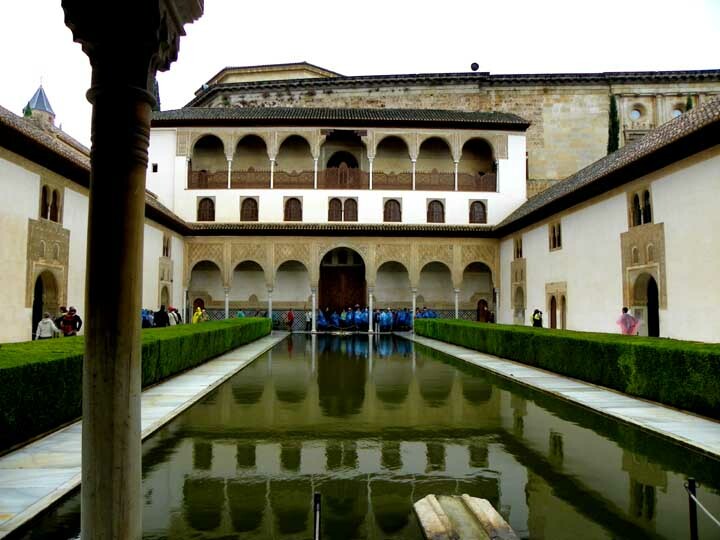 The pool plays a very important role in the architectural and aesthetic definition of the courtyard where the buildings are reflected in the mirror-like sheet of water, giving them greater volume and breaking the excessive horizontality of the place. 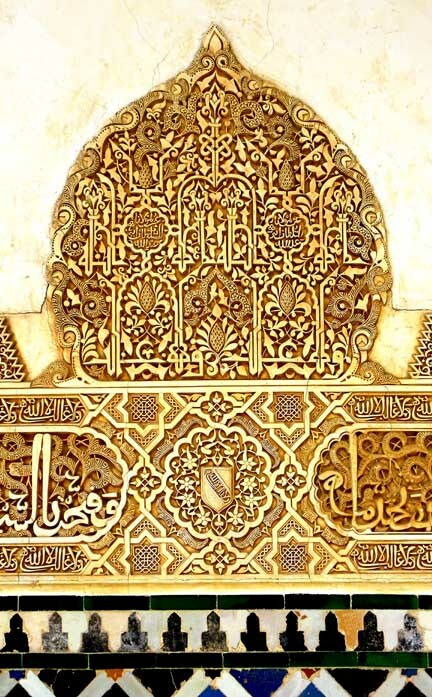 Thus was the focal point of diplomatic and political activity in the Alhambra and without doubt the place where great receptions for ambassadors were held. 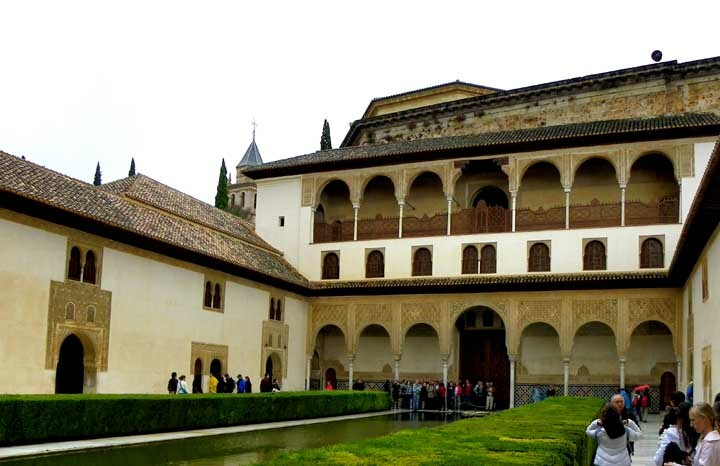 it was also where important visitors waited to be received by the sultan. 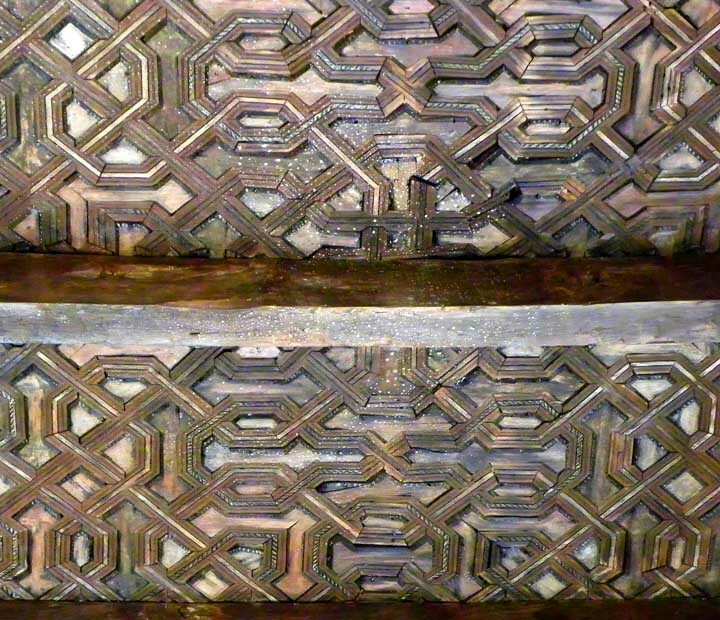 Looking into the Court of the Myrtles towards the south gallery. 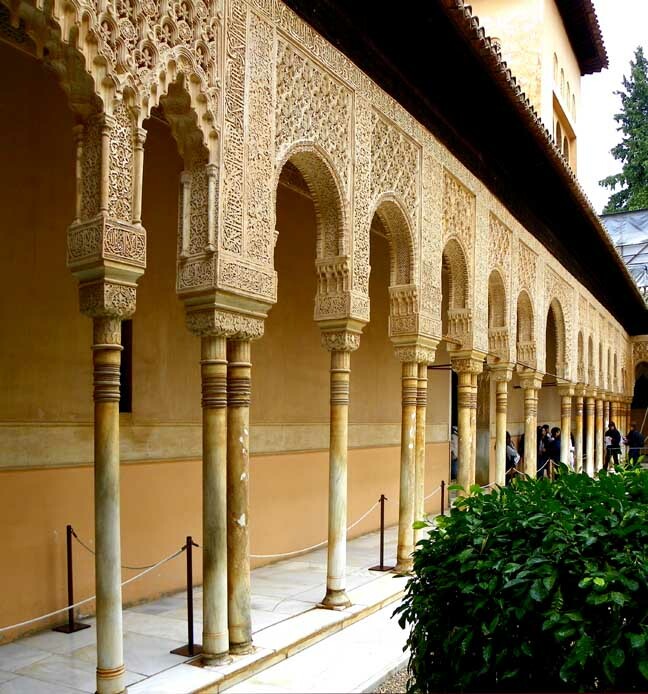 On each side of the shorter sides of the courtyard are porticoes which are, perhaps, the most beautiful and harmonious in all the Alhambra. 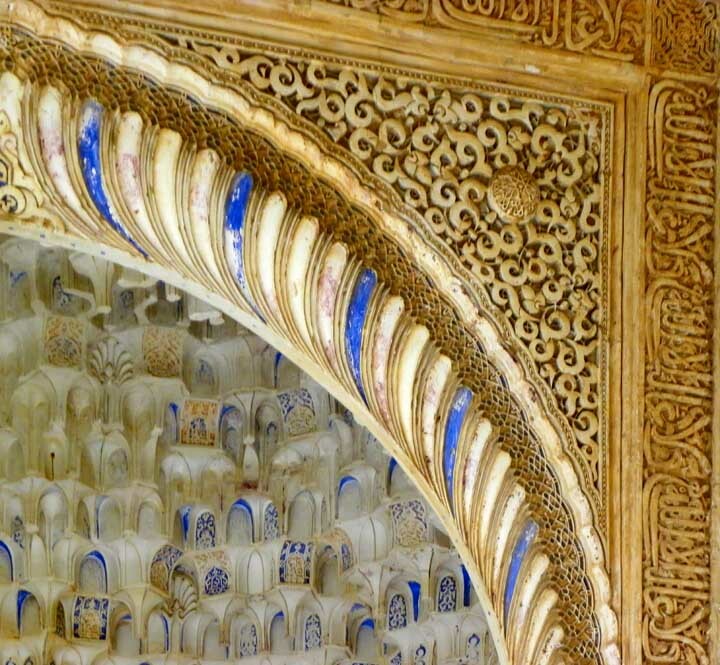 Each has seven semi-circular arches, the central one being higher, and, spreading above, is the typical; decoration of fretwork plaster paneling called sebka. The capital in the center of the photo features stalactite decoration. 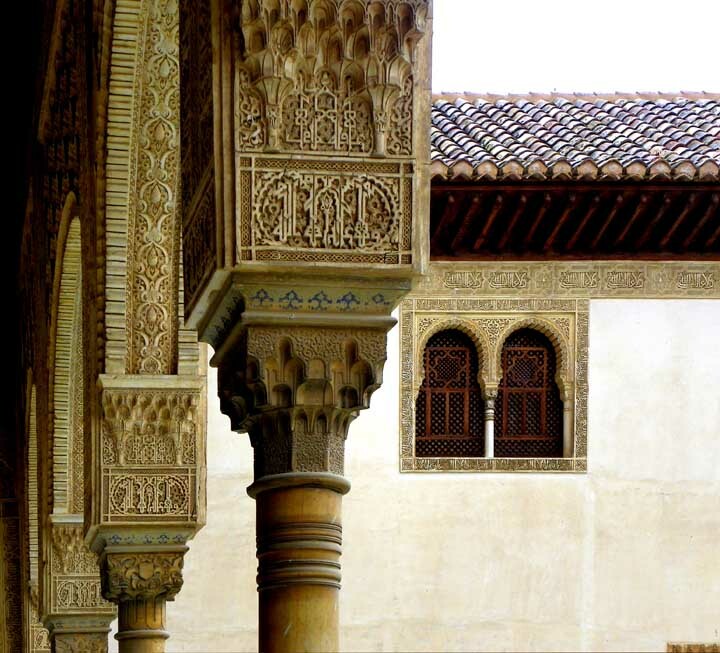 The Nasrid dynasty used stalactites (mocárabe) extensively and used it around the capitals of its columns thereby making a new order of column. 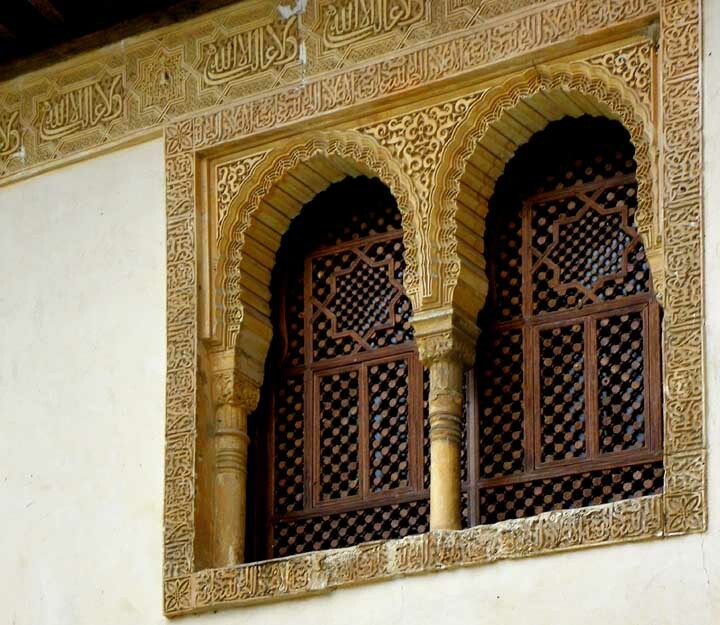 Gadroons: Some scholars suggest that gadrooning has its origins in medieval Islamic architecture, and that European architects absorbed the style after contacts with Islamic cultures. 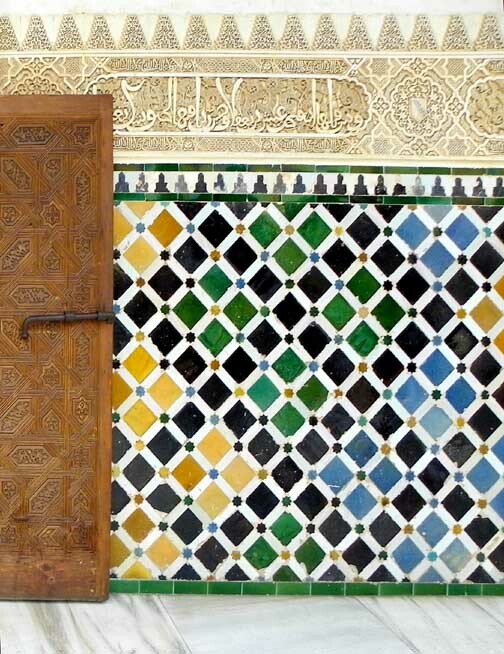 Dado is covered with arabesque ceramic tiling. 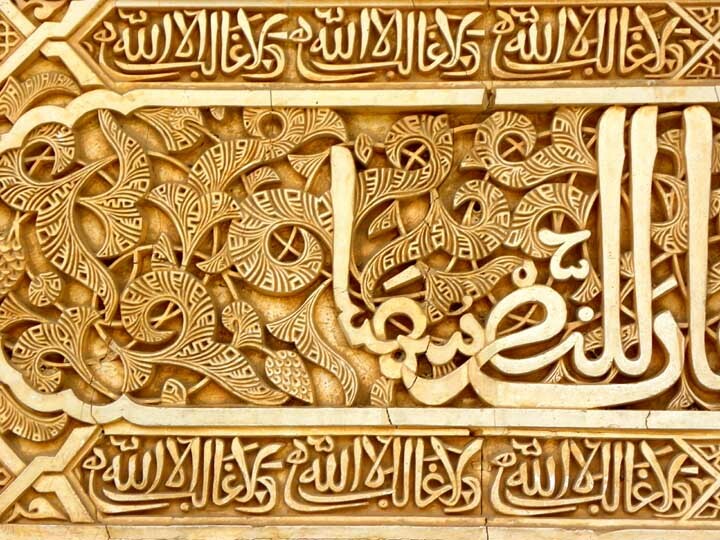 The arabesque tree of life (near the top) crowns the line of epigraphic (calligraphy) verses written around the wall.